April 2011 update Unfortunately, a second attempt to block off the waterfall to prevent the public enjoyment of this picturesque spot has succeeded, a breeze block wall topped with barbed wire now preventing access. A great pity. It is basically not worth bothering to go and see this waterfall now. Below is what it used to be like. This picturesque cascade is located near the cement factory in the Natural Park. It is also easily accessible - to within 100 metres - by car. 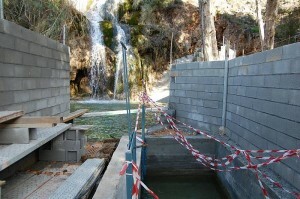 There is a small pool at the base of the waterfall where you can, in summer, take a cooling dip. A popular destination for locals. To drive to the waterfall, avoiding any dirt tracks, the easiest way is: Take the turning to Almijara/San Juan (calle Julio Romero) at the roundabout at the top of the hill leading to Burriana beach. The road bears to the right after about 100 metres and then, a couple of hundred metres on the left is the turning for the Sunday market (calle Cisne). Take this turning and basically continue straight on (calle Mirto) until you reach the top of the hill. There are two roundabouts en route. Where the road bears sharp right, take a sharp left and on you go down the hill with the power station on your left. Keep going straight and just past the two large white water tanks, on your right, is a small track leading up to the waterfall. If you reach the cement factory then you have gone about 50 metres too far, although leaving the car at the factory is probably not a bad idea. Walking from town will depend upon which end you start from. If you are at the top end, follow the driving instructions. From the bottom end of town, you can follow the Rio Chillar walkway (or join it at various points) all the way from El Playazo beach. When the actual walkway ends (calle Puente Viejo, site for the new Health Centre), simply follow track at the side of the river. After 20 to 30 minutes walking you will arrive at a point where you can see the cement factory straight ahead. Go up the hill to the right and then take the small track about 50 metres along on your left. Continuing down the riverbed, past the cement factory on your right, you will enter a rather picturesque gorge. If you keep going you will come to a flowing river. Apart from walking, or driving (Life Adventure do a Jeep Tour), a great way to travel through this area is on horseback!